Yo Noid! 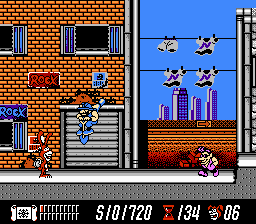 is an action-platformer that stars Domino's Pizza's mascot called Noid. New York City is being wrecked and it's up to you to stop your lookalike Mr. Green from causing further damage. Noid's main attack is his yo-yo, but spells and magic powers can be obtained by collecting scrolls. The level design can best be described as functional, as no imagination went into creating each stage layout; it's almost exclusively a left-to-right affair with no deviance apart from small sections where you can take a higher or lower path. It makes the cute and inviting world seem completely bland and although you'll initially want to dive in and see what it has to offer, there's nothing of interest here from a graphical or design perspective. Your large character sprite features an inconsistent hit-box, and the spotty collision detection means you'll face many unfair deaths, illuminating and exacerbating the one-hit death rule to a greater degree. However, my biggest gripe is reserved for the real-time strategy mini-game that's also used for the final boss. Here, you have a series of numbered battle cards and the object is to score more points than your opponent (e.g. playing a 3 card vs a 1 card will result in two points for the victor). Multiplier and defensive power-ups can also be used if you've found them during the main levels. While everything works fine, it brings the action to a screeching and unnecessary halt (especially as you're repeatedly forced to participate) and at least one proper boss battle would have livened up the action. I also don't like how power up cards are usually revealed in levels by randomly firing into thin air, as it's a lazy way to encourage exploration. Yo Noid! could have used more time on the drawing board to flesh out its under-cooked level design and to rethink the lackluster boss battles. While I do appreciate Capcom trying something different, the base concepts just don't come together as a cohesive whole, leaving behind a very mediocre action-platformer. Random trivia: The original Japanese version (called Kamen no Ninja Hanamaru) featured a young masked ninja in place of Noid.